Did you put it in your cart and check out? i'm dloading update, i'mgoing to install update to 4.5.1.6. If i understand well all plug ins that came with 4.5.0.114 version are compatible with 4.5.1.6 version so no need to update them. If i would like to update them anyway do i need to uninstall them first or i can run the installer as it works for Studio 4 main application update, the installer is going to perform uninstall by itself? If you install an updated plugin it will ask if you want to uninstall the older version, so you don't have to do so as a separate action. 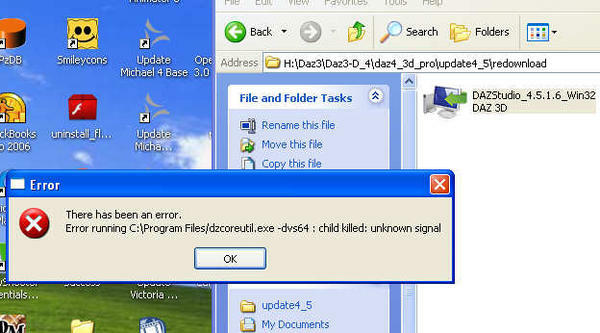 so i installed Studio 4 update 4.5.1.6, windows 7 64 bit, everything fine! Just run installer, it will uninstall previous version by itself. I'm going to update plugin, goz and bridge, just run installer as i did with studio 4 main installation. What about GenesisStarterEssentials_1.6? I suppose it works the same, just run installer, it will uninstall previuos version by itself. I'm not sure which one I have, but can someone tell me if they've fixed the FBX import? Every time I tried it would cause the program to crash. Also, what about the dae format? have they fixed it so you can pose rigged models in a Dae Format? I know previous versions couldn't do that. Ever since I updated to the latest version (non-beta) the content database thingie has stopped working. I've tried starting it manually, but that hasn't worked. Is there something else I need to update, or is there a common fix that others have found that works? The Genesis Starter Essentials will overwrite the existing files. Daz ever going to get the lip sync in the Tab for this newest 4.5.1.6 version? I have Macs and cannot use Mimic because there is no Mimic Live for Macs. I am still using version 3 because there is lip sync in it. Try stopping the CMS, using the Start menu command if you are on Windows, then uninstall it, then reinstall DS to get the new version. I'm really glad I found this thread. I had stopped in to do some research about upgrading to 4.5 from 4 on my 64-bit Win7 desktop, but I'm seeing a lot of nightmares about file system incompatibility, lost old work, installation issues, etc.. I am left with the impression that upgrading the desktop with all my work on it is not yet a good idea, as 4.5 seems unstable and incompatible with deprecated file types. Am I better off just leaving 4 on the desktop, and gradually migrating everything to 4.5 on the lappy? Will 4.5 on the lappy destroy all my old scenes? In general, I have liked 4. But this thread does not comfort one regarding 4.5. For the life of me, I cannot process the pretzel logic behind the file system change. As far as I read those with hiccups in their old scenes just had to resave them (maybe with a 45 in the filename) and then they worked. Thanks, Richard, I will give that a go. I manually move everything where I want it. Uninstalling and reinstalling "The Genesis Starter Essentials " is going to cause me a slight headache, also, I think I read somewhere that Genesis was changed; somethings have been moved from the shaping tab into the paramerters tab. Is this true? WARNING: dzvalentinaobjectdatabase.cpp(36): DB Update To Current Schema error: "UNKNOWN" - write error. DB Update To Current Schema error: "UNKNOWN" - write error. WARNING: dzvalentinaobjectdatabase.cpp(36): DB Register Open error: Stream read error. DB Register Open error: Stream read error. If you have any other suggestions I'll be happy to try them, otherwise I can open a bug report and hope that it can be cleared up that way. Stop the CMS, go to the folder for your database and delete the ContentDB.ind file, then restart the CMS and DS - if that doesn't work, you can try deleting everything from that folder but that will kill your customisations and also exhausts my list of suggestions :(. Did they do something in this build to break instancing? I bought Send in the Clones DS4 Pro because it utilizes that feature. However; the times I've used it; it never worked. All it did was create copies of the prop. I am having a problem with this new one, it has been working fine for about a month now when I go to open it it will not open I get the error message attached below. I tried to install it again and got another error message below. I downloaded it again and tried to install it and got the same error message. Should I just uninstall the whole thing from my computer and try again? I have no clue what these error messages are saying is wrong. What is a dzmsconnector.dll? and where do I get it? You might want to try to install it outside the c:\Program Files folder. I don't seem to have that dll file. One thing to check is that your firewall isn't blocking DS from talking to the content management service - that's the cms in the file name. It is working now, I uninstalled and then it let me reinstall the program again , now everything seems to be working fine. I've got my fingers crossed, thanks for all the helpful information! Did you remember to clear your browser cache between download attempts. If you have an incomplete or corrupted download in your cache all subsequent attempts will fail at the same point.